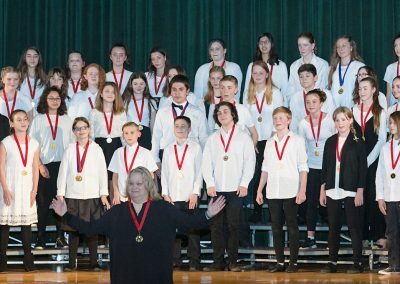 Since 1955, the Tuolumne County Superintendent of Schools Office and the Tuolumne County Music Educators’ Association (TCMEA) has coordinated an annual countywide elementary music festival. The festival was started as a way to showcase all of the individual music programs at the elementary schools. The Tuolumne County Elementary Honor Music Festival has continued and prospered due to the efforts of past and present music educators. The festival carries a great deal of tradition in Tuolumne County and generations of families fondly remember their participation in this event. Bruce Paxton, the countywide music consultant, was instrumental in starting the festivals and was actively involved for 30 years. Sadly, Bruce passed away in 2005. As a way to honor Bruce and the legacy he began so many years ago, this festival is dedicated in his memory. Mr. Hull taught in the public schools for 33 years, starting as a music teacher with the Lake County School District in Lakeview, Oregon, then as Director of Bands at Fresno’s Central High School. In 1986, Mr. Hull was appointed Director of Bands at Manchester GATE School in Fresno, where he taught until his retirement in 2014. In that same year, Mr. Hull was voted Outstanding Music Educator in the Central Section of the California Music Educator’s Association. He has a special love for starting beginning instrumentalists and has sent many well-trained young musicians on to the next level. Since 1993, Mr. Hull has been a professor of tuba, taught music education courses and has directed performing groups at California State University, Fresno. He is proud of the many fine music teachers he has helped prepare for their careers.